Do you ever get stuck on a tricky problem? I sure do. A good way to approach this is not to try and solve the whole tricky problem, which can seem daunting, but instead to just clarify the one or two things you can do to get unstuck and keep moving, like in today’s coaching call. Thanks to those of you who reached out to give me feedback on our very first live coaching conversation podcast in episode 104. You’ve told me that the idea, the approach, and the value is all positive, so thank you. Regular listeners will know me for passionately spruiking and putting into practice a few key concepts. First, that better learning leads to more growth and ultimately better performance. Second, that better learning is tapping into the wealth and social and experiential sources we have available, which contrasts to the wealth of plain old information, of which there is no shortage, and it only contributes a small amount to our learning, growth, and performance. And third, two of my most favourite, and in my opinion most effective, ways to leverage social and experiential learning is through coaching, which is heavily centered on reflection. Today you’ll hear my conversation with Carmen. Carmen’s challenge is really significant – she is working every day in the suicide prevention and support space and wants to help a very specific group of people, who have ‘lived experience’ with suicide and back in the workforce. 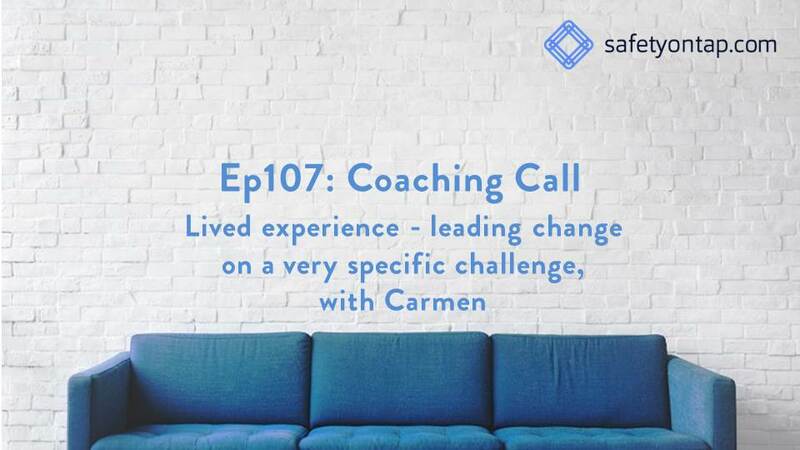 I have to say, when Carmen asked me for some help, I really did wonder whether I was the right person to help since this isn’t the normal kind of work and normal kind of challenges that I work with. Which really speaks to the blending of coaching and mentoring which is the style you heard in Ep104. But that’s the beauty of coaching, which is anchored in a process, so doesn’t require me to be an expert or have experience in the coachee’s context. And that’s where the value came from. Carmen was stuck, and after this conversation, became unstuck. That was a curly one, hey! Someone recently asked me about the challenge of coaching in these episodes, suggesting it’s a relatively short amount of time to achieve meaningful progress. I couldn’t agree more. I don’t want to imply that coaching is a quick hit, immediate gratification exercise. It rarely is. But what I hope these kinds of conversations help reinforce is that it is possible to make progress when you are stuck, and having someone like a coach can enable that. It’s not solving the world’s problems, just getting unstuck. The coaching I do sometimes has a quick un-stucking outcome like this, but most often progress deserves more time, reflection and effort that one conversation. In any case, I hope you still get some learning from these conversations. A few things come to mind after that chat. Firstly, how bias affects our thinking. Carmen was down the path of a Code of Practice, and no doubt felt sunk cost bias associated with that. It also has an anchoring bias, where you are focussed on and stay close to one anchor point from the beginning. Bias like this affects us all and having someone else see and challenge these works really well. Episode 81 is all about biases, you might like that episode. The other big theme for me centered on the people Carmen was trying to help and influence, her customers. Carmen had them fair and square in her sights from the beginning of this journey. Episode 56 called Know Your Customer could help you get focussed on your customers. If you would like some help out of a tough challenge, getting through some inertia, or tackling a significant opportunity in front of you, why not think about some coaching? If you want to explore that option with me, head over to safetyontap.com/talk, and let’s talk! If you would like to be a guest on the podcast, so we can hatch some schemes together to help you overcome a challenge or move towards a goal you have, let’s press record. Let me know by visiting safetyontap.com/guest, hit the coaching link, and we’ll get the ball rolling! And finally but most importantly if you think that this episode would help someone else you know, in your team or a colleague at another company, why not give them a free gift? Tell them about it, send them the link safetyontap.com/ep107, not only will they be grateful, I would be too for spreading the word.